History major Mia Counts won the award for best senior thesis. College of Arts and Letters students made a strong showing at Notre Dame’s 7th annual Undergraduate Scholars Conference, which showcased more than 250 research, scholarship, and creative projects from across the University. 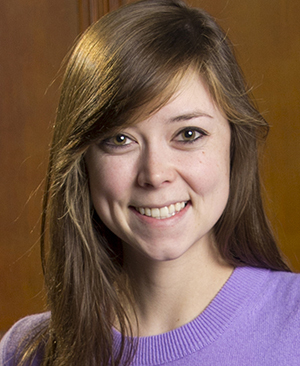 At the May 2, 2014, event, senior history major Mia Counts ’14 won first prize in the Undergraduate Library Research Awards sponsored by Hesburgh Libraries and the Center for Undergraduate Scholarly Engagement. Her winning senior thesis, “The White City: The Effect of Urbanization on Ethnic Integration in Colonial Merida,” was advised by Karen Graubart, Carl E. Koch Associate Professor in the Department History. Counts’ senior thesis is a biographical sketch of Mérida, the capital of Yucatán, Mexico from 1542-1700. The project focuses on the physical and demographic multi-ethnicity of the city. Peter Cummings ’14, a political science major, received honorable mention for his senior thesis, titled “Democracy and Student Discontent: Chilean Student Protest in the Post-Pinochet Era.” Cummings’ adviser was Scott Mainwaring, Eugene P. and Helen Conley Professor of Political Science. 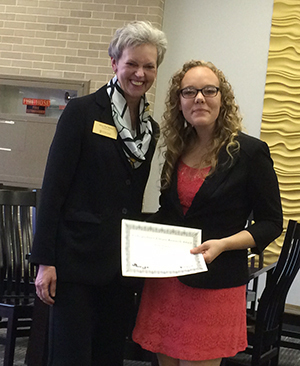 Diane Parr Walker, Edward H. Arnold University Librarian, congratulates Shelby Niemann. Shelby Niemann ’14, an anthropology and English major, won the award for best paper submitted from a 20000- through 40000–level class. She wrote “Death in Irish Ballads” for a course called Bards and Balladmongers: Traditional and Popular British Song in the 18th Century, taught by post-doctoral fellow Ian Newman in the Department of English. Iona Hughan ’14, a Program of Liberal Studies (PLS) major, won honorable mention in that category for “Charles Villiers Stanford and the ‘Irish Symphony,’” a paper she wrote for Music as a Liberal Art, a course taught by PLS Assistant Professor Christopher Chowrimootoo. The award for best paper submitted from a 10000- or 20000-level class went to first-year student Caroline Trustey. She wrote “Medical Marijuana and Epilepsy” for a Writing and Rhetoric course taught by Michael Westrate, a Ph.D. candidate in the Department of History. First-year student William “Robert” Billups won honorable mention in that category for “Historically Black Colleges’ and Universities’ Relationship with Civil Rights, Then and Now,” a paper for a University Seminar called The Civil Rights Movement through History, Literature, and Film. The course was taught by Stuart Greene, an associate professor in the Department of English. • organization of project material. Originally published by Kate Garry at al.nd.edu on June 10, 2014.